DEAR ANNA: If you want a long lasting blacktop driveway, don't concentrate too much on the thickness of the actual blacktop. The blacktop in and of itself is not the source of strength. The rich looking smooth black surface that you walk and drive on is merely a top dressing that hides the muscle just below the surface. You should talk to both contractors and ask them questions about the type and thickness of the gravel base that will be installed under the blacktop. Blacktop is simply a form of concrete. It is typically a mixture of sand, stones of different size and liquid asphalt. The sticky asphalt binds the sand and stone together and acts as a superior waterproofing material. This is why asphalt drives and roadways can withstand years of abuse from Mother Nature and still perform. But the asphalt binder has one slight drawback. Although it seems to be a solid material, it actually can flow or move when pressure is applied to it. This flexibility is often an advantage as blacktop can conform to subtle changes in the sub-soil beneath the pavement that might otherwise cause cracks in a traditional concrete or brick driveway. But even blacktop can crack. Strong blacktop driveways are typically built using crushed angular gravel as a base. 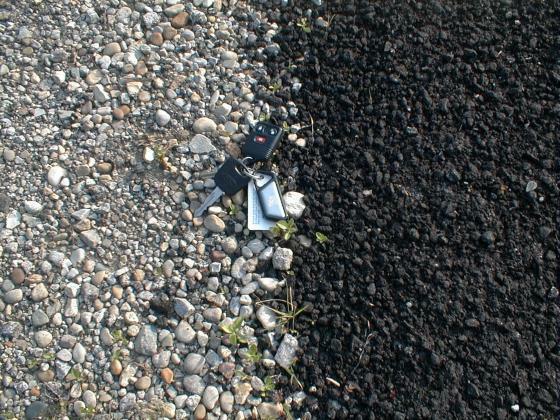 This gravel needs to be a minimum six inches thick for light vehicle traffic such as cars and pickup trucks. If you expect larger commercial trucks to roll up and down your driveway, I would install a gravel base that is a minimum of eight inches thick. Get the best-looking asphalt driveway around! Learn what to ask your contractor in my Asphalt/Blacktop/Tar & Chip Installation & Repair Checklist. I offer a 100% Money Back Guarantee. The soil beneath the gravel must also be of good quality. Once the driveway is excavated, the soil should be compacted before the gravel base is installed. If the driveway is located in an area of wet or marshy soil, you should consider installing a special Geo-textile fabric over the soil before the gravel is installed. This fabric stops soil and silt particles from fouling the gravel. If silt and soil gets into the gravel, it acts as a lubricant. The gravel loses considerable strength when this occurs. Install the crushed gravel in layers. The first layer should be three to four inches thick. It should be graded fairly smooth and then compacted with a heavy rolling machine. Once completed, install the second lift of gravel. The the width of the gravel base is very important. It should extend six inches beyond the blacktop wherever possible. This extended gravel base prevents the edges of blacktop drives from cracking off when a car or truck tire kisses up against the edge of the pavement. The two inch thick layer of blacktop should be fine as long as the gravel base is installed correctly. Adding extra blacktop thickness will not significantly extend the life of the surface. Keep in mind that blacktop is available in many different blends and mixtures. Each mixture has its own recipe of the sand, gravel and liquid asphalt components. Talk with each contractor and ask which blend is best for your area. If you get conflicting answers, then you better get a third opinion. If any utility trenches cross the driveway, be sure they are filled with gravel or a structural fill material. A soil-filled trench that has not been compacted can lead to a catastrophic driveway failure in future years. Plan ahead for invisible dog fences and light posts. Install several plastic conduits under the driveway in key locations. These empty pipes will come in handy down the road when you find the need to install a cable or wire under the driveway. Finally, do not seal your new blacktop driveway for at least one year. The driveway needs to cure for months before it begins to develop a hard skin or surface. If my driveway is collecting water in a large area and it was laid within a year, I'm talking about a section of 50x19 ft. It has water puddles etc. how can this area be corrected ? Ed, an overlay. Explaining how to do it requires lots of typing, plus I have some questions for you so I can give you the correct answer(s). I only do pithy answers here in the comment section. If you want to protect the investment you have in your house and not waste time or money *hoping* you make the right decision, you should talk to me on the phone for just 15 minutes. It'll be the best investment you've ever made in your home! Hi. I had my asphalt driveway repaved two weeks ago. The contractor left a few shallow indentations in it from work boots. I don't want to be picky, but they're very noticeable to me and also will most likely collect water and freeze this winter. How can I remove these? Should I heat the area with a blowtorch and use a tamper on them or could that damage the asphalt? The depth of the new asphalt ranges from 2"(that section is on top of existing pavement) to 6" (where the existing pavement was cut away). Thanks for any advice.